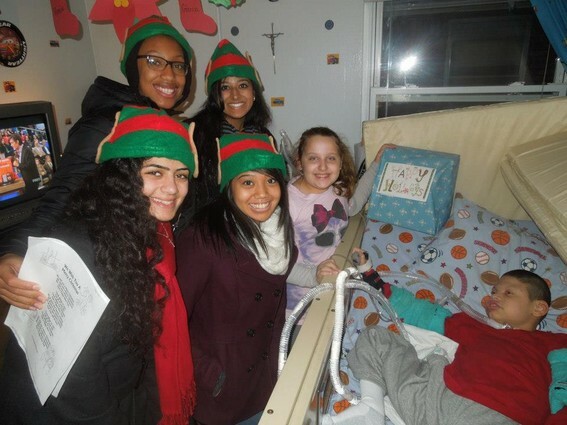 University of Illinois students returning in December to bring holiday cheer to children throughout the Northern New Jersey area. If you have a sick or disabled child that would enjoy a holiday visit filled with carols, smiles, and cheer please contact us ! University of Illinois @ Chicago Alternative Winter Break student volunteers giving a week of their time to help bring a smile to New Jersey's children in need. This student run organization chooses approximately 10 charitable organizations each year to travel to and heighten UIC students understanding of social justice issues. They are known throughout the university as well as Chicago first and foremost for their service-learning trips and Pediatric Angel Network is excited to host them once again this year! Students are from a pool of 400 applicants and include students majoring in the Healthcare Sciences of Nursing, Medicine, Neuroscience, Physical Therapy, Nutrition, Social Work, and Biology. The volunteers plan on spending the week of December 16th 2018 fundraising, delivering gifts, singing holiday carols as well as spending time with sick or disabled children and a day of service in a local Children's Therapy Center! Busy week full of kindness and giving!